Carefully designed observing lights are set on the river bank of observatory. The brightness is adjusted to the dusk of Rausu, when Fish-Owls begin to call and hunt fishes. The sensitive area of owl's eye is limited within 10 degrees from the center of field of view. As the lights are set on tall poles, the beams come from 30 degree above the horizon, and owls do not feel glare. The pupil of owl's eyes are kept wide-open by these design concepts. As the lights illuminate the river by an adequate brightness and angle, it provide an ideal environment for Fish-Owls to find wild fishes. Owls stay hours within the illuminated area and often hunt wild fishes. Live Yamame trouts (Oncorhynchus masou) are put in the feeding pond located in the middle of small river. We usually set fishes before it get dark and owls come up to hunt them according to their own schedule of day. A family of owl hunt more than 25 fishes in summer and autumn and 3-6 fishes in winter. Observing Cabins are built on the river side. 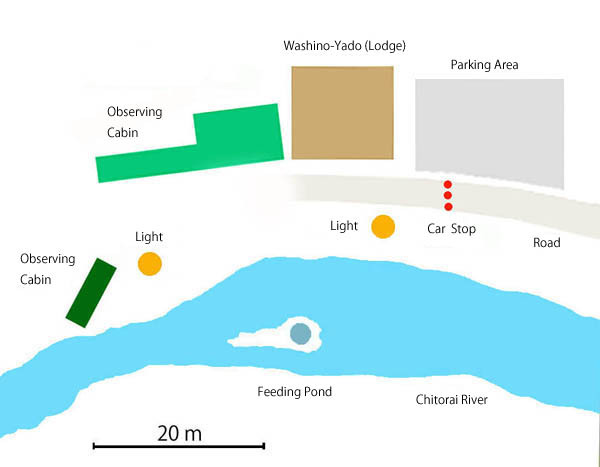 All observers /photographers have to stay in ether observing cabins or guest rooms of Washino-yado(lodge). Observing cabins are located 20-30m away from the feeding pond. As the Fish-Owl is a very big bird, this is close enough for photography. A 500mm telephoto lens for full frame camera or a 300mm lens for APS camera would be adequate. Cabins have tables and chairs, and are heated in winter season. Free coffee and tea are available.